Happy New Year everyone! 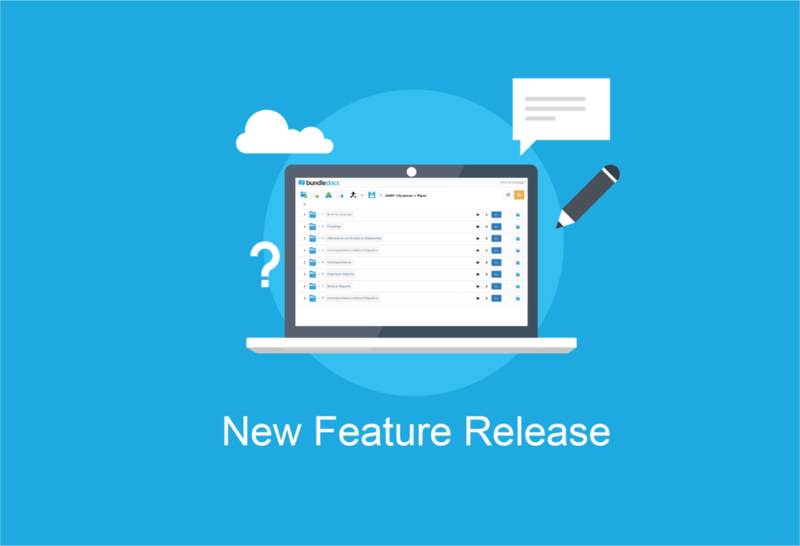 We’re delighted to be back to tell you all about our latest feature releases and what’s new in the world of Bundledocs. Let’s jump right in. We’ve all been there. You’ve uploaded a load of documents at once only to find they’re in the wrong order. Not to worry. Now it’s easier than ever to sort your files in Bundledocs. If you’ve been using Bundledocs for a while you will know that you can already sort your documents by date - in either ascending or descending order. Fancy a recap on how this is done? Check out our announcement post here. Note: This option will only appear on screen when you have ‘Show Document Date on Screen‘ selected for this bundle. Full details on how this can be done are covered in the manual. 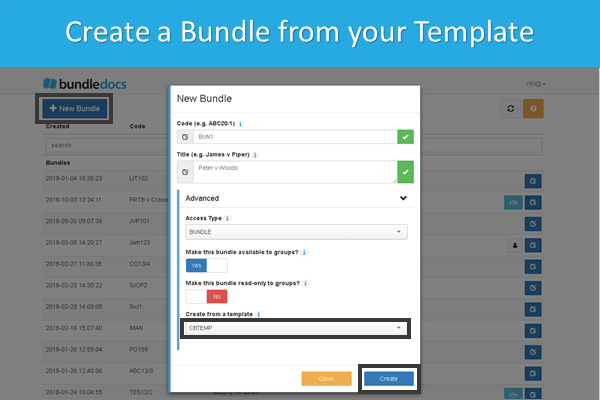 Don’t forget, Bundledocs offers a number of ways to quickly and easily order and sort your bundles. Why not check out our Feature Focus post on the Moving Documents in Bundledocs (it even includes a short video so you can see it in action!) to see how this can be done. Getting to know these options is great for those who want to help save even more time or for anyone working with large bundles. Ready to give it a try for yourself? Login to your Bundledocs account now and see for yourself. Earlier this month we were delighted to announce that we will be exhibiting at the upcoming British Legal Technology Forum 2019 on March 12th. This is one of Europe’s largest legal IT conference and exhibitions and it is one certainly not to be missed. Our team have been showcasing at the event over the last few years and each year we look forward to meeting with our clients, partners and showcasing how Bundledocs works for everyone that stops by. Thinking of attending this year? For full details on the event and where you can find Bundledocs on the day, check out our recent ‘Come see Bundledocs at the British Legal Technology Forum‘ post. Can’t wait to see you all in March! Remember with Bundledocs you don’t have to wait around for software install and feature updates, everything is available for you now. Simply log into you Bundledocs account and give them a try for yourself! Have a question? If there is anything you need to know simply get in touch with our awesome support team. They’re on-hand to help get you familiar with everything Bundledocs. Prefer to go it alone? No problem. Our complete training and user manual is available to download 24/7 directly from your account. Easy! 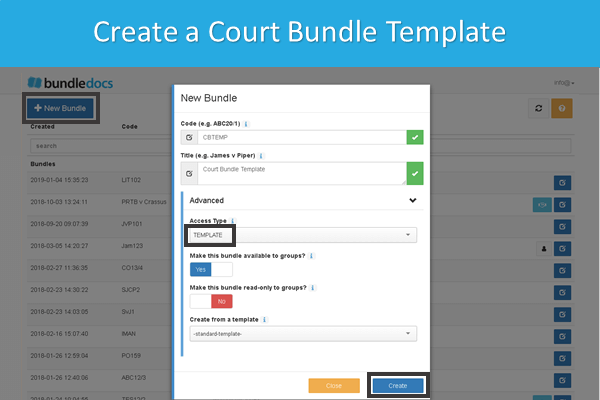 Do you need to prepare a court bundle template or looking to see how to create a court bundle? Then you’ve come to the right place. Bundledocs court bundle software is your go-to solution if you need to easily prepare court bundles anytime, anywhere. Templates come in really handy for those that create bundles regularly. It will save you loads of time as you can save your bundle structure, format settings and won’t have to repeat the same steps time after time. Top Tip! 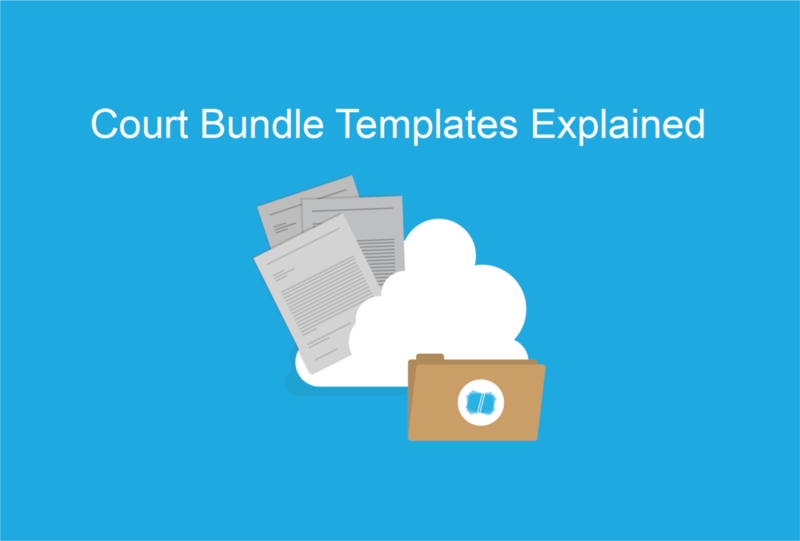 If you need to create a single court bundle then there’s really no need to create templates. Just jump down to the next section where we will take you through the simple steps needed to create a court bundle. Create your Template. 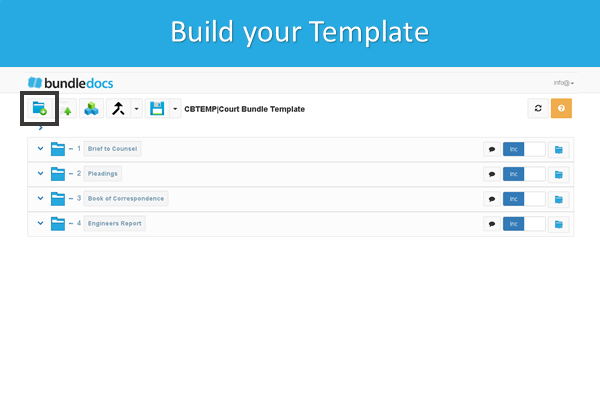 Name your template, within the ‘Advanced‘ section choose ‘Template‘ and hit ‘Create‘. Build your Template Sections. Create sections for your template (you can create as many as needed). Customise your Template. This step is optional but if you want to change the look and feel of your bundle this is where you do it. For example, upload a custom cover page; change where your page numbering appears; or even change how your index/table of contents page looks. So many possibilities! Save. That’s it. When you’re finished creating your court bundle template click ‘Save‘. All your settings will be saved and ready for when you need to create your court bundle. That’s it. Your template is created now and ready for use. All templates appear on your home screen and can be changed or amended at any time. Now we’ve successfully created our template, the next step will be to create our court bundle. We simply need to choose what template we want to use and Bundledocs will instantly create our bundle for us - pulling in all the customisations and settings we set previously. Create your Bundle. Give your bundle a code and title name. Choose your Template. Expand the ‘Advanced‘ section and select a template to use for your bundle. For example, we will choose the ‘Court Bundle Template‘ we just created. Create. Simply hit ‘Create‘ to build your bundle. Ready to Go! Now our bundle is created we are ready to add documents and build our bundle. Create your Bundle. Give your bundle a name and hit ‘Create’. Add Sections. Select the ‘New Section‘ button to create your sections (if you’ve created your bundle using templates this will be already done for you). Upload your Documents. Upload all your documents into your bundle sections. Just drag and drop your files to move them into the right place. Generate. We’re almost there. If you want to change any settings for your bundles you can do so here. Otherwise, just click the ‘Generate‘ button. Download. It’s complete. Your court bundle is instantly available to download, send or share. At Bundledocs we’re committed to making your life easier. That’s why we created an awesome solution to your court bundling woes. It’s simple really, we do all the hard work for you. Don’t believe us? Let’s take a quick look at how Bundledocs can help you create court bundles with ease. Upload Any Document Type - A court bundle can contain a range of different document types from word documents, pdf, images, emails, scans. With Bundledocs you can upload any type of document and they will be automatically merged into a single PDF file when you generate. 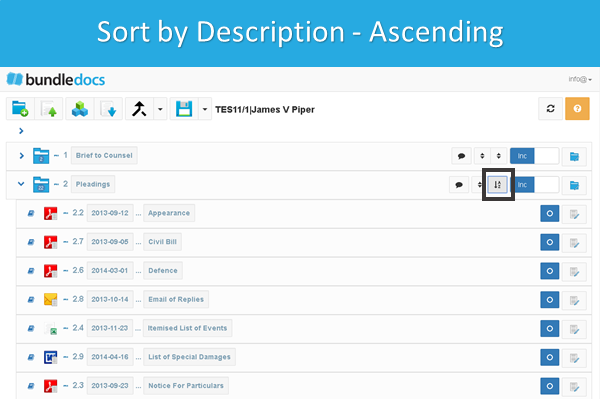 Bundledocs Creates your Index Page - Your index page will contain a list of all documents contained within your court bundle. Bundledocs will create this index page for you. That’s not all. We will also hyperlink each item so you can instantly find what you want, when you want. Bundledocs does all the Page Numbering - No need to worry about making sure the numbering of your bundle is right. We handle all this for you. Changes are Simple - When it comes to creating court bundles, there are always changes to be made. Whatever change you need to make simply click Save and your bundle is updated. Printed Court Bundle and Electronic Bundle - All bundles are instantly available in PDF format. So you can send by email, use Bundledocs Secure Share or download and print to have a physical hard copy court bundle. No upfront fees, no install - just get going. Only need to create a single court bundle? No problem, we’ve plans available for everyone from self litigants, legal professionals and law firms worldwide. Don’t believe us? Give it a try for yourself. We offer a free trial so you can give it a try before you sign up. There’s absolutely no obligation and no credit card required, so there’s no reason not to give it a go! 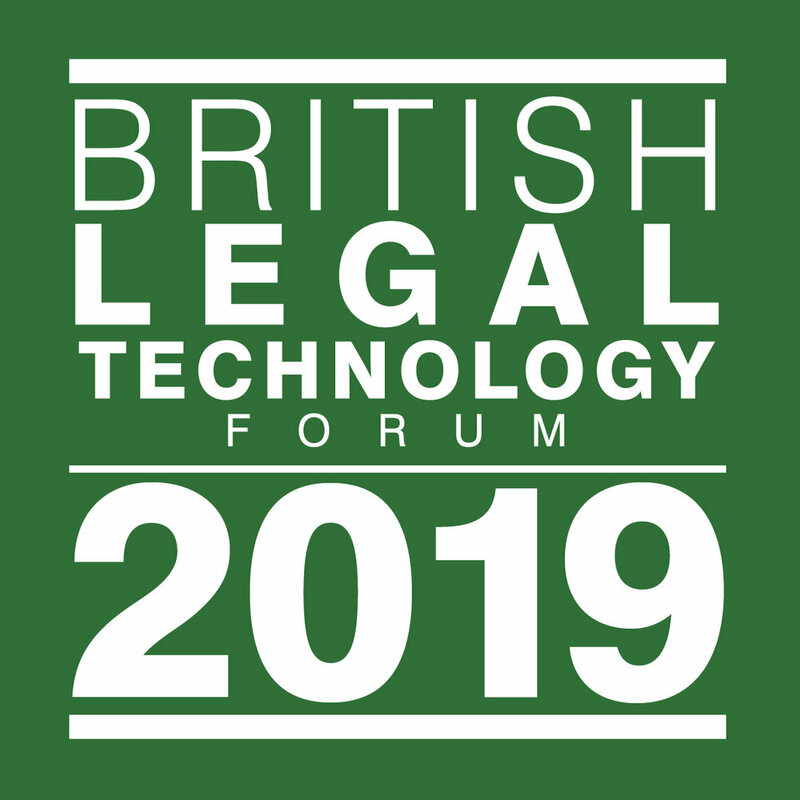 Bundledocs are thrilled to announce we will be showcasing at the upcoming British Legal Technology Forum 2019 in March. Will you be attending? BRITISH LEGAL TECHNOLOGY FORUM 2019: WHAT TO EXPECT? The British Legal Technology Forum is Europe’s largest legal IT conference and exhibition. Produced by the guys over at NetLaw Media, each year this event gets bigger and better than ever. So what can you look forward to this year? The British Legal Technology Forum 2019 will bring together the most respected professionals from both the legal and commercial technology sectors to examine and explore the systems, strategies, processes, and platforms that will drive law firms and legal businesses into the next decade and beyond. In addition to the awesome programme, The British Legal Technology Forum 2019 will also deliver over 110 leading technology suppliers who will be showcasing the finest technology and IT security available to law firms and legal businesses today. Bundledocs are delighted to be part of the British Legal Tech Forum again this year. If you are attending then make sure and drop by our stand. We will be positioned at Stand Number A05 so come and say hi! Need more convincing? Check out this short video to see what we got up to at last year’s event. How can I register? For all event information including visitor registration, visit the official British Legal Technology Forum website - www.britishlegalitforum.com/delegate-registration. Will you be attending the British Legal Technology Forum this year? Make sure you are following Bundledocs on Twitter, LinkedIn, Facebook, Google+ and YouTube so you won't miss a thing. Hope to see you there!